Bigfoot News | Bigfoot Lunch Club: HBO's The Newsroom will Pitch, "Bigfoot is Real"
It may be a fleeting moment in a single episode of paid cable. But this is not just any TV show. 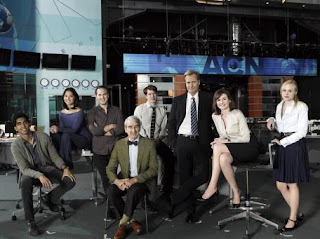 This is The Newsroom written by Aaron Sorkin, one of the most famous writers in entertainment. Aaron Sorkin is an Academy and Emmy award winning American screenwriter, producer, and playwright, whose works include A Few Good Men, The West Wing, the Facebook docudrama The Social Network. His newest venture is The Newsroom on HBO, an attempt to romanticize what happens behind the scenes of a TV news program. According to the episode guide for season one, on July 15, 2012 Newsroom blogger, Neal Sampat (Dev Patel) will pitch a Bigfoot is real segment for the nightly news show. You may remember Dev Patel from Slumdog Millionaire.